The Cover: I love this cover. I love the font, the way the cover is designed, and I love the model. The model looks like what I would imaging Ela to look like. She is innocent looking, dressed in robes, and carrying her "walking stick". I love they they put an effect on the stick to make it look like it was glowing. I think the cover designer did a beautiful job on this book. The Characters: The characters are what really shine in this book. I love Ela's innocence, with an occasionally sassiness. I love that the author made Ela a real person to me- she wasn't some mindless puppet. Ela had real feelings and desires and was struggling to ascertain what was appropriate to feel and do as "the prophet". I thought Ela was brave, intelligent, and a heroine I truly cared about. Ela's love interest (who will remain nameless to avoid spoilers) was sarcastic and a little vengeful, but transformed through the course of the book into someone that both Ela and the reader fell in love with. The Story: This was an easy story to read. I loved that the world the author created wasn't incredibly complicated. Fantasy novels have that problem usually- they spend the entire first half of the book world building. The author blends world building seamlessly into the narrative to create an enjoyable fantasy story. I am not sure why this is being recommended to people who like the Hunger Games. I get that the Hunger Games is popular right now, but I think the comparison does Prophet a great disservice. Prophet is not a dystopian- it is fantasy, and if you read the two genres they are not incredibly similar. 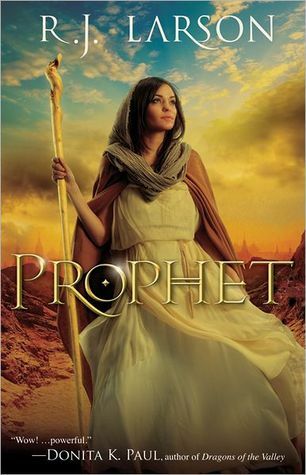 Prophet is an excellent book and Hunger Games is an excellent book- but they are not the same. Christian and non-Christian readers will enjoy this fantasy novel. I am impressed by this author and can't wait to read more!